Automatically fills in missing information in your music library. 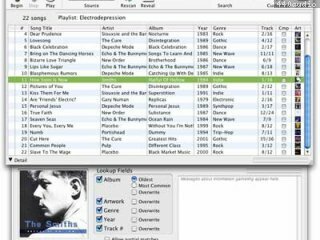 MPFreaker searches the internet to find out what album that song belongs to, the year that song was released, what genre that album belongs to, track numbers, even album cover artwork -- and automatically adds this information directly into your song files, in seconds. By using industry standard methods, you can see and access the new information MPFreaker adds in any audio player which recognizes these standard information "tags", including iTunes and the iPod. Artwork added by MPFreaker is automatically shown on the iPod Photo's "Now Playing" screen! Lyrics gathering improved for song titles with parentheses. Copes better with iTunes being unresponsive. Copes better with poorly formed XML created by iTunes. Several rare crashing bugs fixed. Many other minor tweaks and fixes. Improved manual (now uses standard OS X help system). Added spinny indicator in window corner for background metadata loading. Cleaned up Français and Deutsch localizations. More reliably remembers what playlist was chosen between launches. Slightly improved library and playlist load times. Manual lyrics search no longer goes straight to the first result. Reading of MP3 id3v2.4 tags improved. Can now properly display unparenthesized genre numbers as their genre names. Can now choose between regular releases or beta releases for update checking. Fixed bug which could cause adding of artwork when not desired. Copes better when working with a playlist that the user subsequently removes. No longer will overwrite a track number lacking a track count unless "overwrite" is checked. Re-enable "Corrupted Song Info" window. Minor tweaks for Snow Leopard. - Several minor improvements and bug fixes. - Many, many small improvements and bug fixes. MPFreaker is no longer beta software, and will not expire. Très simple à mettre en oeuvre, complet et efficace.